She wrote in the post: “Congrats on Jason on his gold medal (sic). Judy Murray, the mother of tennis star Andy, who is from Scotland, replied: “A unique hunt? Disgraceful. “It’s a goat. And it’s in Scotland, on a beautiful island. In another image Ms Switlyk was crouched down next to a goat she apparently killed, and wrote: “Beautiful wild goat here… Such a fun hunt! Twitter user Mererid wrote: “This is truly dreadful! Ms Switlyk, who is described as a “world renowned hunter” on her website, also shared a photo of herself with her hunting partner next to a dead stag. Twitter user Siobhan Thompson replied: “Stay away from our wildlife. 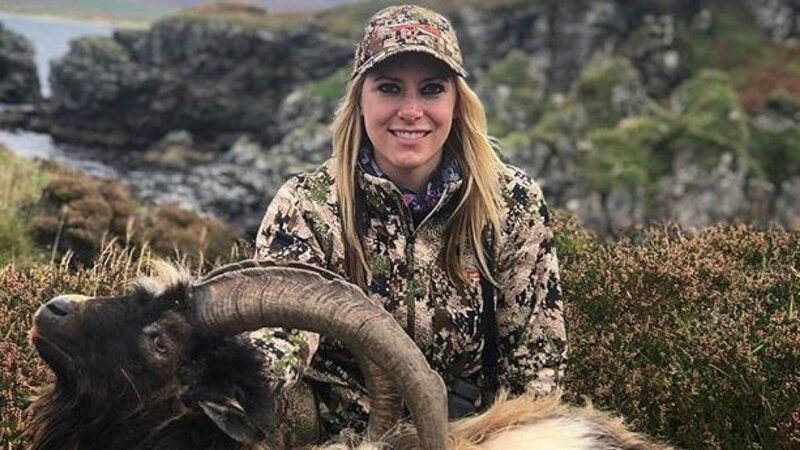 Sarah Moyes, activist for OneKind which campaigns against animal cruelty, said: “It’s utterly shocking to see these images of Larysa Switlyk and other hunters posing for photos with the wild animals they killed on a recent trip to Scotland.